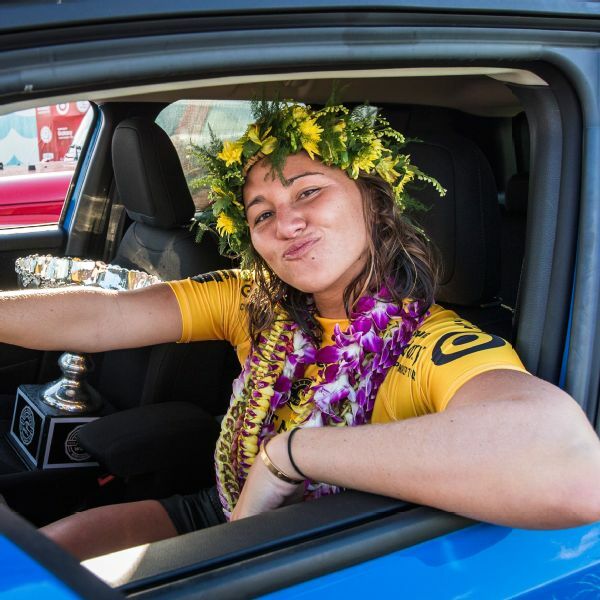 After clinching her third World Surf League world title in four years in Maui, Hawaii, last month, Carissa Moore is ready to relax and enjoy her epic win. In one of the most heated title races in pro women’s surfing history, Moore eventually bested the season’s star comeback surfer, Courtney Conlogue. Moore became the youngest female world champion in history when she first won in 2011 at age 19, but it hasn’t necessarily been easy. Despite her talent, she’s been open about the struggles she’s faced on the championship tour — with her weight, body image and even Internet trolls. She talked candidly with us about self-acceptance, confidence and what she wants every woman — surfer or not — to know in 2016. I never make those “hottest surfer girl” lists — and I don’t care. It used to bother me because all of my peers were on them, and I would look at myself and be like, “Why am I not hot? Why am I not beautiful? Why don’t all these people think that I deserve to be on those lists?” Anyone would ask those questions. There are the really skinny surfer girls out there, and I’ve realized I’m not one of them. I can’t try to be one of them, so I’m gonna find something that’s unique and beautiful about me — which is my strong legs and my arms. One day, I would love to have a six-pack, but right now, I’m happy. My body does amazing things. I have been to some dark places in my journey of living a healthy lifestyle. I struggled with binge-eating. That also led to, one time, trying to make myself throw up which wasn’t something I’m very proud of. No one should ever think that low of themselves to inflict pain. I don’t know when it started, but I’ve always been insecure.I used to size my wrists every day with thumb and forefinger just to make sure I was still feeling thin. In high school, I’d pack my lunch, eat everything in the morning and wouldn’t eat for the rest of the day. Then I’d get home from school, and I would just stuff my face and then I would feel guilty again. At some point, I would wake up in the middle of the night, eat, go work out and go back to bed. It wasn’t healthy. It didn’t feel right. It didn’t feel good. Now I’ve gotten to a place where I don’t feel imprisoned by food anymore. I’m in a good place now. I feel comfortable with what I eat in front of people. It’s all about balance for me, and that’s translated to every part of my life. I enjoy ice cream. I enjoy cookies. And the same goes with surfing: I work really hard, but I also find time to rest and relax. I’m just really comfortable and happy in my own skin at this point. I’ve learned to block out the haters — literally. I got this tweet from this random guy saying, “Oh, it looks you’re pregnant, and you’ve been taking on a lot of water weight and have been eating too many French fries.” I just laughed at it! Block. Delete. It doesn’t bother me anymore because I feel good about myself. I don’t really read articles about myself, or at least if I read them, I don’t keep scrolling to the comments. The comments I do read, I just laugh them off, or I’ll tell my boyfriend, Luke, or my dad, and they’ll laugh it off with me. I also know when to say “eff my diet.” Everywhere I travel while on the Women’s Championship Tour, I try to get a place with a kitchen so I can cook. I think the hardest place to stay on track is when we stop in Europe just because there’s so much bread and pastries. For those few weeks you’re like, “Uhhh, eff my diet, I just have to live how the French live and eat what they eat.” Then when I get home, I’m getting back on track. I think the hardest part about losing weight is focusing on that end goal. For me, if you see that progress, even that half-a-pound if you’re doing the scale deal, that’s great. Just focus on that little bit of success rather than, “I have to lose 15 pounds in two months.” The stuff that lasts is when you take the time to do it right. Having goals keeps me on track. For me, having a defined goal is so important, otherwise I’m wandering around lost. I definitely have to take some time to think about where I want to go in 2016 with my surfing and my life. I wish every girl could know this. Between ages 16 and 20, your body goes through so many changes. And then at 20, 21, it just kind of settles into itself. There’s something special and unique about you. Don’t try to compare yourself to anyone else. Don’t try to be someone else. Confidence is the best accessory. I think being healthy and strong is the most beautiful thing. I think it’s important for girls to know that everyone goes through these struggles, so don’t feel alone. Find a healthy way to get through it and embrace yourself, embrace the journey.